We will develop this area bit by bit and if we are ready sometime sometimes four categories have: In general, bicycle trip, canoe tours and walking. Are to be altered at the moment, however, still in the stress the side and have inserted, hence, first of all the old bicycle trip tips. 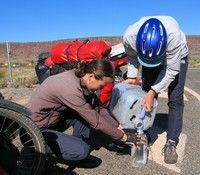 To make cycle touring easier to cycle touring novices, we have put together a few tips. Nevertheless, the list claims by no means to be entire or to have found always the sample solution, but describes merely how we have solved some things. Should somebody have for something a better or easier solution, we would be pleased if he could send them to us by email (martinlunz@yahoo.de). Have a lot of fun reading and cycling. Foreign health insurance: We have purchased our foreign health insurance with the DKV (German ill insurance, www.dkv.de). The foreign health insurance is valid for trips up to 3 years and can be still extended by 2 other years with double contribution clause. 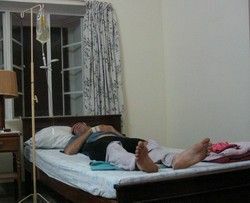 In the insurance all treatments and drugs are enclosed, and we should be once in a country with miserable medical care, even the transport becomes if necessary in a country with one with Germany comparable med. Care assumed. After our insurance has run out after 3 years then we have got with STA Travel an insurance for a year (relatively for a good price). They fly back to us in a medical emergency even to Germany. Equipment: The list is so extensive that I have put them to the end. Budget: We try to get by possibly with 5€ per person and day and have during the first both years in each case less than 2500, - € per person needed. In the budget all expenses resulting on the trip are included like, food, overnight stays, flights (India - Thailand and Bali - Australia), repair, Visas, souvenirs, tours, exchange rates (diving exchange rate), guest's presents.... Are not included the foreign health insurances (our parents make as birthday presents) and Sonderanschafungen as for example a new photo or a player MP3. 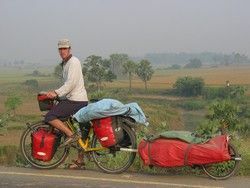 In comparison to many other bicycle trips a rather narrow budget, however, we sleep almost exclusively in the tent (in India and South-East Asia, nevertheless, also many guesthouses) and cook itself (except in India and South-East Asia, because are a matter eating is cheaper there than cook). Theft: Although one expects it maybe differently, up to now we had no theft problems. There we in twos travel one remains with purchasing or sightseeing, nevertheless, also always with the wheels. But in India we have even our bepackten wheels sometimes laxly one hour before a shop leave without something disappeared. We have meanwhile rather that feeling just the people in the poorer countries, on the one hand, no notion we have expensive our equipment is (most think our wheels cost 100€) and, moreover, they are too proud to steal. Bicycle theft seems to be rather a problem of the rich industrial nations. Invitations: In particular to the Muslim countries we are everyday to eat, to spend the night or at least on a cup of tea been invited. While we have mostly accepted the invitations on a cup of tea (unless it was the nth invitation on this day and we wanted to get on) we were very fastidious with food or overnight stay invitations. In principle we have refused every invitation only 3x (is so usual in the Arabian countries) and then accepted when we had the feeling that it could be the beginning of a friendship (we have accepted in principle no invitations because we wanted to sleep sometimes comfortably in a bed or wanted food abschnorren). 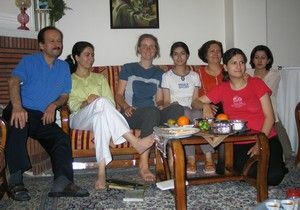 As a small thank-you we have shown to our hosts at least our photo album and our map of the world or our small slide show on the television to divide our experiences with them. To recollection we have again given them a photo of ourselves. From the photos we during the invitation have made we left in the next town deductions and had sent to our hosts afterwards by post. What particularly pleases us that our philosophy has risen, because we stand with nearly all our hosts also furthermore by email in the contact. So that they can follow our trip furthermore we remaining also many shares of our Internet site into English translated. Bicycle: We have simply equipped our old MTB's for the trip with a Rohloffschaltung and carriers. Though an amount costs the Rohloff, however, I would not like to miss them any more. The switch comfort, in particular in the mountain or in the town traffic is really world-first-class! Moreover, nearly no maintenance costs. 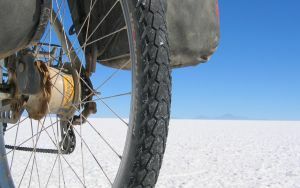 I have exchanged the first chain after 18,000 km in India although it would still have held long and I have exchanged the second chain after 24,000 km (whole 42000 km) in Chile. 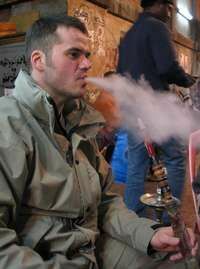 If we the Falkanadier have, besides I transport him on a bicycle follower (Weber Monoporter). Closer information about our bikes see equipment. Flying with the bicycle: In principle no problem, some airlines pick up them, however, not free of charge as a sports equipment and require a surcharge (free of charge, e.g., with Garuda Indonesia). We get a bicycle cardboard with the nearest bicycle dealer around them also before the flight always certainly to pack. We solve the overweight problem while we many heavy cases with in the bicycle cardboards pack. All valuable and heavy ones come to the hand luggage. If a Duty Free bag catches you, there are able to do her cases heavy over again reinpacken and as a hand luggage mitnehemn. 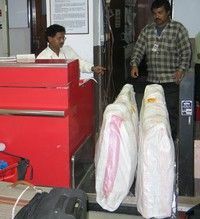 The Duty Free bags are not checked normally and are weighed. The petrol cooker can fly with become also problematic. Here briefly what one must make according to Internationally air to transport association around him to be allowed to pick up: 1. Petrol or fuel leave for minsestens 1 hour from cooker and petrol bottle rauslaufen. 2. Cookers and bottle in the open air at least 6 hours ventilate. Wrap in sucking stück material, pack into a Platiktüte and with a sticky tape seal. If the time reaches to do not ventilate, then Kochöl in petrol bottles and by cookers wash up. This reduces the flash point and one saves the airing time (then, however, the cleaning problem has later). We use the airing method and with the stack I simply put the petrol bottle in the bottle holder in the bicycle. I transport cooker and pump also apart of each other, so that in the case of doubt only one share is confiscated. Draw money: We could win the NAPSA (Nassau broad savings bank) as a sponsor, and have thus no account processing fees. Though we have also visas and a Mastercard, nevertheless up to now it is also to be drawn money everywhere easily possibly in with the normal high-speed train map (maestro). For safety reasons we have here always only one small amount on our current account and the rest on a Diba account, thus nobody to our money we should can come to lose once our maps. We deal with all referrals easily by Internet banking in the Internet cafe. Homesupport: We cannot regulate most things from on the way, however, by far yet everybody. When our friend offered UFO to us, our Homesupport to machne I thought only that there is to do there, actually, nothing. How I have been deceptive micht there! I must send every few weeks an email with a cry for help. If it is to be asked for him to update the Internet site, worked off Ausrüstungs would counterbe to complain or to dealt with a player MP3. Here briefly a short description of the ideal Homesupport: easily daily by email accessible, he knows like one works on an Internet site, he knows a lot by bicycles and Outdoorausrüstung (importantly if you must describe a problem to him, because, otherwise, he has no notion of what you speak), fun has to help you. Vaccinations: Clarify best of all before with a tropical doctor and on time enough before with the vaccinations start (mind. 1/2 years). We have vaccinations against tetanus, polio, hepatitis A and B, yellow fever, diphtheria. Against malaria we have only one drug to the treatment in the case of an infection including. We have and take no Malariaprofilaxe, because we are too long in the tropics (Pakistan - Indonesia a total of 1 year) and us the possible side effects of a Malariaprophilaxe for such a long period were too big. Moreover, there are too many different malaria parasites to be protected 100%. Internet site: We have furnished our Internet site with 1und1.de. Though the side is not they all nicest, however, thanks to the so-called Websitecreators I can work on from every PC worldwide my Internet site myself or update. Merely if the Websitecreator is not to be opened once again by a PC for some reasons smart I the texts and pictures to my Homesupport UFO, so that he can on-line put everything. I write the texts for the Internet site on a small Pocket PC (half board Jornada 728) on which I also work on the pictures and compress, then she copies on a memory map CF. I conclude the memory map then with a map reading machine in the Internet cafe to every PC in around the updates to make. I use the Pocket PC, by the way to write, also around my diary or to store the photos (4 GB of map PCMCIA) to them has certainly at home have arrived. Islamic countries: In particular because of the position of the German government during the Iraq war, the travelling in the Arabian countries was for us a true joy. We were virtually carried on hands. However, a little bit unpleasantly the youthful stone throwers are in Jordan (Kings highway between Petra and Amman) and on Sumatra. Many men in the Muslim countries do not know how one behaves towards a woman and think that all western Mrs. Freiwild is (they see in the Hollywood films). Hence, we have always spent ourselves as married and Nadine has often carried even a headscarf. Merely in Iran and in Pakistan the headscarf was prescribed, and in Iran, in addition, one more coat, provided that Nadine has not cycled. 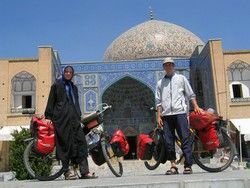 Apart from headscarf and coat Iran is a great travel country, however, also for women. Up to now the most hospitable nation. 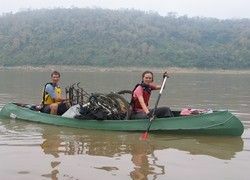 Folding Canadian: Till present we have paddled on the Danube in Serbia and Bulgarians, the Ganges in India and the Mekong in Loas with our Faltzcanadier. River we have put back so approximately 1000 km in about 4 weeks. We have an AllyFaltkanadier (16.5 feet long and 17.5 kg). With the paddle we put the bicycles upside down in the boat. During the Radeletappen we pack the canoe on a follower (weaver Monoporter). 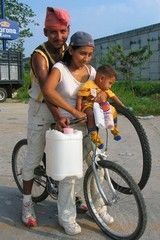 To the water transportation we always get 20 l of water canister. One can pick up fruit and vegetables in a boat richly. Children: Although we are not cycling with children we have already met some families, and they had all a rather different solutions to cycles with children. but, everybody had equipped their bicycles with carriers and lowrider and had their luggage in panniers. 1st trailer: Kid with toys in the bicycle trailer. Advantage: Child protected from the sun and rain. Child can play. 2nd Trailer + Kids Bike: Child in the trailer and, in addition, the kids bike which can be fastened to a bicycle of the parents ("Follow me" or wheel with pole). Disadvantage: One must carry along a trailer and a kids bike! 3rd Recumbent trailer: Child trailer which also can be used as a recumbent bike( Hase Spezialraeder). Advantage: Child can cycle, rest or play according to desire and mood. 4th tandem: Child sits with one of the parents on the tandem. 5th child on own bike: (without or with luggage). Which possibilety is the best depends of course quite individually on every child (age, how is motivated the child to cycle....), and of course on the destination and the travel length. Cooking: We cook on a petrol cooker (MSR Whisperlight Internationally) and manage with it very well. Because we must use only filling station petrol we him, nevertheless, more often sometimes clean. At the beginning we had installed the cooker still in a Trangia system, however, for weight reasons we have sent him then home (ideally however if one wants to cook in spite of all warnings in the pretent there it very solidly stands and is sheltered from the wind). Our favorite dish is noodles with tomato sauce (nevertheless, fresh tomatoes) is very easy luckily to make, nevertheless, meanwhile we have also learnt to cook a little more extravagantly in the bushes. Here some menu tips on the other side from fried eggs and noodles which clap with us: Bread dumpling with mushroom sauce, noodle soup with fresh vegetables, Lassagne, pudding (does not burn almost if one powdered milk used), pizza (dough: 250 g of flour, 100ml water, oil, yeast, preparation: Dough in oiled frying pan lay with tomato sauce coat and book, with low heat on the cooker roast) claps really!!! !, pancakes, bread (either brook mixture shop or make (cf. pizza dough perhaps, however, wholemeal flour) and in tin-foil muffledly about 15 minutes in the glow of a burnt down fire lay, rice pudding, rice with roasted vegetables, rice with Chenna (Indian lenses). Rice claps, by the way, perfectly in a small pressure cooker (1.5 l of aluminium in India for about 3€ to have). Simply waters with rice boil and provide. If the sauce is ready, the rice (perhaps between by over again briefly on cooker is ready also put). Though the pressure cooker weighs a little bit more, however, he is very efficient and saves a lot of petrol. Communication: At the beginning we have started to learn then many words into respective languages, however, sometime we came absolutely in a mess, so that we have spoken in a clause at the same time in Russian, in Turkish, in English and in Arabic and to us of course nobody more has understood. As a result we have limited our vocabulary to this all most necessary one (hello, goodbye, request, to thanks, yes, no, water, 1-10, tent) and have managed with it, actually, very well. If we wanted to have then something more special we to us with one without words Dictionary managed (Point it (photos) and without words Dictionary (pictures) of Langenscheidt). In the dictionaries there are hundreds of pictures / photos of fruit and vegetables, about means of transportation (train, airplane...) up to accomodation (hotel, tent...) . Around the local to those we have met our travel plans to explain we have signed to us own map of the world on which clarity-half in each case only the countries are painted colorfully which we have also travelled around. We have marked in the map then our itinerary. To give an image to the people of it like we travel and how it looks in the single countries, we have invested to us a small photo album. Beside pictures of the impressive places of interest (pyramids, Kapadokien...) we also have pictures of our tent and from Nadine like she cooks just on our cooker. Even if we are able to speak with the people no word thanks have been possible for map and for photo album up to now always at least a little communication. Music: Sometime annoyed us that gedudel in the Arabian countries, in India and in South-East Asia totally. In the beginning we still had a small travel radio including, however, anyhow we were to be found too silly a good transmitter, so that we have him sometime heimgeschickt. Meanwhile we have a small player MP3 with 1 GB of memory and properly much good music on it. Now over small external loudspeakers we can hear easily together music. 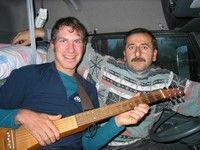 Ansonstdn has Martin a small travel guitar (MARTIN: Baking packer) including. 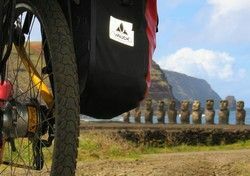 Post: We have belonged from other bicycle travellers that they can be sent cases by post (Postrestante). Up to now to us this was always too unsafe and, hence, we have always waited with our orders, until we have received visit. We have gained good experience, nevertheless, with the home-smart of souvenirs. We have sent the cases always by sea way (the most favorable variation) and up to now all packages have arrived safely at home. Take photos: We have decided to take photos Digitally. To have the possibility later, perhaps, still to present our pictures in the circle of friends than slide show we have to us a Canon G5, purchased a compact camera with very good image quality. In particular in view of the use of the photos for a slide show I make all pictures with the highest resolution. As a memory medium we have two 512 mb of maps CF and 2 128 mb of maps CF. In each case 512 mb and 128 mb of map fit on a CD which I allow to burn in regular distances in Internet cafes (mostly costs between 0.5€ and 2€). Another advantage of the digital camera is that we can already show now our pictures during a small slide show with invitations, because we can simply link up the photo to a TV and get cracking. 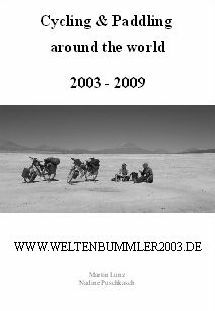 Guidebooks: We are travelled of beginning without guidebooks, however, have found out meanwhile that one experiences with a guidebook substantially more and searches the times in those one for something (post, guesthouse, Internet cafe...) can substantially shorten. Trips meanwhile always with Lonely Planet. Though the best background information do not have Lonely Planet, however, as a long time traveller we can notice to us anyhow not everybody. To the organisation of the everyday life are Lonely Planet, however, absolutely first-class, in particular because they for accomodation some price categories do not separate right prices brag! Route planning: We plan our route in principle from on the way according to visa term, seasons and places we like to see. Sponsors: Although we have found a lot of equipment sponsors, unfortunately, I can give no right tip like one to sponsors touches. I have worked in the Outdoorshop of a friend and knew most sales representatives of the manufacturers personally and if not I, then at least my friend. Our sponsorship up to which with the Nassau broads savings bank (free account) is no sponsorship because we have no liabilities (however, we send them, nevertheless, over and over again pictures). Most manufacturers have done either to me or my friend a personal favour. 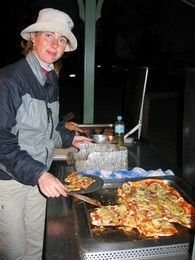 Bushcamping: We mostly sleep in the tent and for a peaceful night a good overnight stay place is very vital. 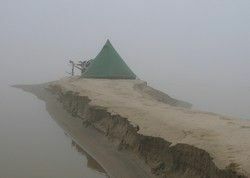 In principle there is 2 philosophy: Camp site so that one is seen by many (surer, however, in particular in Asia hosts of curious visitors) or one hides in such a way that one is seen by nobody. We have decided on the 2nd version and up to a few boys in India at night sometimes stones on the tent have thrown we have remained also unmolested. Here some criteria after those we select a camp site: Not observably also not if we use at night a flashlight or cook, sheltered from the wind, subsoil with rain not immediately becomes soft (mud battle), good accessibility of the street. Mostly we sleep in the bushes or in woods, however, in principle tunnels are also suitable (small tunnels under streets through behave) very much (in particular Syria and Iran). 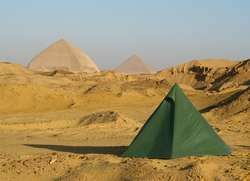 To tents in wild areas, however, is no problem, because one can creep away easily behind the next sandy dune. In particular in close settled areas we service to shortly before sundown before we our tent are not based around to be seen. While we mostly take all luggage with in the tent, the bicycles stand barred before it. Traffik: In principle not so badl as one may think. 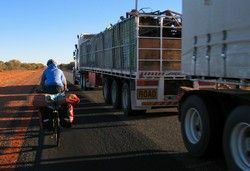 In particular the dreaded Roadtrains (more than 50-m-long truck in Australia) would be nearly hand-tame. Nevertheless, more dangerous are more following and towns: Teheran (shared taxi one drastically reaping around an other customer to gather, Indonesia (especially Jahrkarta), Australia east coast (above all, the LKW's), New Zealand (constantly). Visas: Visas one can make easily also on the way. Merely some countries require a recommendation of the German embassy ("Letter of Content" for 20€!!!). We always try to make the visas 2 countries earlier to have still air if a little bit does not clap. Here briefly a list which visas we have made where. If everything itself checks, however, at the embassies, because the things can change very fast!!!! Laundry: We do our laundry mostly in the folding bowl from Nicely to place. There is hand washing powder outside from Central Europe in every shop. Very helpfully in particular with spots is a laundry brush. As a clothesline we have an about 10 m long very thick hinge string including. I have wrapped the hinge string around a film tin and inside of the film tin have stowed away small clothes pegs. Water: According to region we drink up to 6 l daily only of water with cycle. However, unfortunately there is not in the dry wild-like areas on every corner a tap or a shop. The water we during the day need we advance in several 1.5 l of bottles PET (teils5-6). Advantage of the bottles is that one receives them anyhow if one sometimes a coke shops and if she then after some weeks starts to muffen, one can still decontaminate them. Should we have sometimes about bigger distance no possibility to refill water, we refuel, in addition, to our 10 litres of water bag. We have cycled in Germany loose and have got used so slowly to a worse water quality. We have drunk up to now without problems always unfiltered tap water or well water. Although we have a small water filter including, he is still unused. Nevertheless, merely in Cambodia the well water was too dirty to us once, so that we have boiled it for safety's sake. 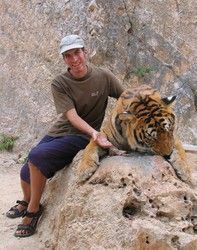 Wild animals: With animals we had, actually, relatively few problems. nevertheless, the gigantic, wolf-like sheepdogs were fear-giving lake and Dogubaiazit) in the Turkey(more exactly said between the van. Once we had a rat in our tent sit and differently sometimes rats have eaten to us 20x30cm big holes in some of our watertight bicycle pockets. Queues have seen, actually, only in Australia (zw. Brisban and Sydney). The Mosquitos are worst, nevertheless, often! Have tried out meanwhile a lot nevertheless best of all we drive (smoked spiral, Anti mosquito candle...) with a normal pumping spray. Tent: Empty dome tent Space II of VAUDE. Advantages: largely enough for 3 Pers. with luggage to be based fast very wind-solidly. Disadvantages: To be out hard relatively hard, with active ones. Pick up in any case a tent base! come without it to the inside tent rains. Clothing (a lot, nevertheless, wore out already and meanwhile with clothing VAUDE substituted): (Martin and Nadine a Hintertasche shoes in Nadines front wheel pocket) - rain jacket: TNF: Atmosphere Jacket: very robustly, well fits, really tragecompfort and in addition still easily. - Rain trousers: Jack Wolfskin: Bike and Hike rain trousers: easily, strengthening in the seat area, well fits, nobody schnick chat. - Gloves: Haglöffs-Powerstrech: quietly greater take and with strong rain still pull elastic gloves about that, - pullover: Haglöffs: Powerstretch: make a mess comfortably, make a mess warmly, nice paints, we love him. - Unterziehjacke: Haglöffs: small stack measure, very warmly, but only if it becomes really cold necessarily. - Powerstrechhose: Nadines hibernation suit, warmly and comfortably. - Socks: Smart Wool: Hiker (winter) and Casual (summer): very comfortably, in spite of lasting for days use hardly sweat feet and little odour education, are her money in any case value. - Cap: Buff: Sound, headscarf, this share for all cases. - Trousers: Fjell-Raven MT trousers: to clean well comfortably, slightly robustly, and quickly drying. With her one also cuts in the civilisation a fine figure. - T-shirt: Vaude: aerial, comfortably and robustly. - T-shirt: Haglöffs: wide cut, very warmly, hence, well for cold regions. - Underwear: Vaude: really Tragecomfort and no seams them can press. Easily and quick as a flash drily. - Bath clothing: Name NO Bicycle trousers: 2 pieces: various manufacturers: It pays attention to a good inside feed and you well fits, this is the ALPHA AND OMEGA. - Windcheater: Big stack: to clean really extremely easily, wear the really comfortable jacket almost constantly (had to carry in Iran long). The hochschiebbaren sleeves are smart also. Unfortunately, attention: black fades. - Sandals: Teva: Terra Fi: the presumably best Outdoorsandale is also perfect for cycling. - Shoes: Raichle: GTX: It would have been enough comfortable shoes with good sole, however, for us also without Gore Tex only wellingtons wellington help then in strong rain: Name NO: the only one what with strong rain really uses. Bikes: -Nadine: Marine Nail Trail: the old bike of UFO (presumably 13 years old) still runs as smeared!! - Martin: Cannondale f800: if it already had as a MTB and it has simply altered circuit: Rohloff: Speed heave: we go to meanwhile 33000 km and two oil changes still with the second chain. Above all in the mountains and in the town traffic the switch comfort is incomparable. Also strong mud and desert dust can wear to her nothing. For pilgrim's eagles with certainty the first choice. 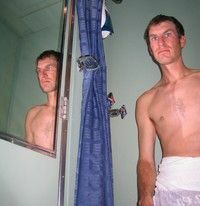 - Tyre: Swallow: Marathon XR: still have the second set on it! Can one make a bigger compliment? (however, with a coat the fabric has dissolved from inside) - speedometer: Sigma: BC 800: good bicycle speedometer without Schnick Schack-bicycle back light Sigma: above all importantly if one has at nightfall still no camp site and in tunnels castle: Specialized Wedlock: really stable bicycle castle with small stack measure carrier: Tubus Cargo: really solidly, and, nevertheless, easily, no problems Lowrider M.: Tubus: Swing: fits thanks to special construction of Udo also to a Fatty feather fork Lowrider N.: Faiv: very clever Lowriderlösung for feather forks. Unfortunately, the bells are weakly resigned a little bit, so that we had to trade them. Are trouble-free to him functioned he. - Bottle holder: Name NO: importantly these are they also for 1.5 l of bottles PET fit drinking system: Camelback: Drinking tube simply by a hole in the lid in 1.5 bottle PET put and the perfect drinking system is ready!! Sleeping-bags and Isomatten: (Front wheel pockets) - spring and autumn: Yeti: Magic Bag 400: really brilliant sleeping-bag system, perfectly for all pairs which cuddle at night with pleasure. Really weight savings, because one ordinarily needs only one sleeping-bag - midsummer: Cocoon: Tropical sleeping-bag: umgenäht on Magic Bag system it is the ideal supplement for the hot summer nights. - Winter: JW: Crystal Palce Woman: So that also chilblains can have sweet dreams like Nadine at-5 degrees. If we had in the wintry mountain world, besides.-Isomatte: Therm a rest extremist light: really Liegecomfort, on no case without losradeln!!! The back will owe it.